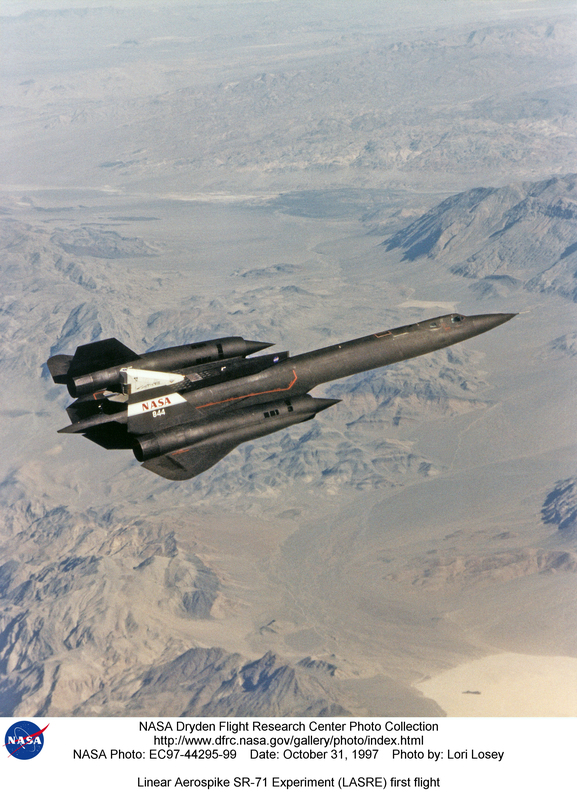 Description: A NASA SR-71 made its successful first flight Oct. 31 as part of the NASA/Rocketdyne/ Lockheed Martin Linear Aerospike SR-71 Experiment (LASRE) at NASA's Dryden Flight Research Center, Edwards, California. The SR-71 took off at 8:31 a.m. PST. The aircraft flew for one hour and fifty minutes, reaching a maximum speed of Mach 1.2 before landing at Edwards at 10:21 a.m. PST, successfully validating the SR-71/linear aerospike experiment configuration. The goal of the first flight was to evaluate the aerodynamic characteristics and the handling of the SR-71/linear aerospike experiment configuration. The engine was not fired during the flight.